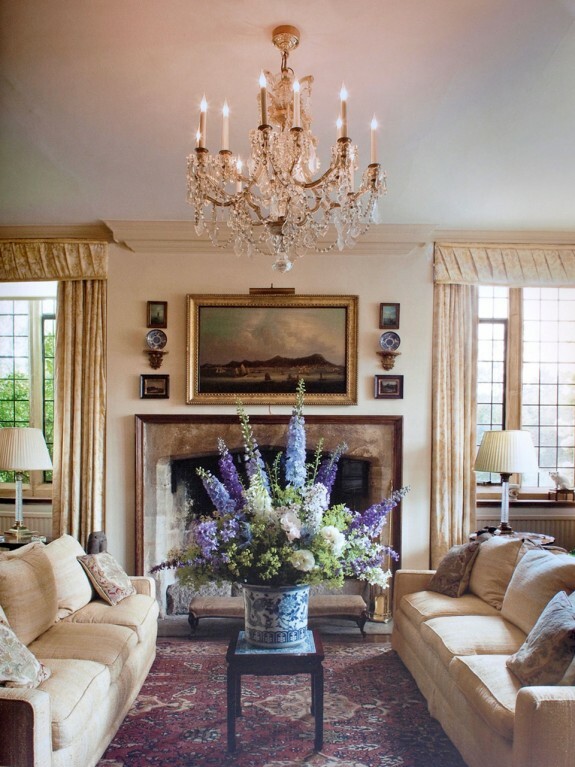 The yellow drawing room with it’s fitted Fortuny curtains and contemporary sofas flanking a hamstone fireplace mantel original to the house. The Venetian chandelier was made in Murano, Italy, and was a gift from the client’s mother. The painting over the mantle is a Chinese Hong painting of Shanghai, circa 1830, one of a number of these views throughout the house. The vase on the coffee table is a Ming Drum, late 18th Century. The crystal column lamps were purchased in London. The crystal column table lamps were purchased from Vaughan of London.